Daft Punk have spent quite a bit of time as of late assisting others fine-tune their tracks. After working on two singles with The Weeknd, Arcade Fire have become the next to recruit their immense skill in co-production, utilizing the legendary French duo for the entirety of their forthcoming album, Everything Now. 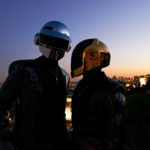 In this particular case, Daft Punk member Thomas Bangalter rose to the challenge of creating the LP alongside famed Canadian band and fellow producer Stevey Mackey. According to the credits, Bangalter provided the synths in addition to co-producing each track. Its debut single, also titled “Everything Now,” is of course more representative of the Arcade Fire aesthetic, though subtle disco and funk elements that present themselves within the folds of the single clearly show Bangalter’s hand in the piece. “Everything Now” has been released alongside a scenic music video, which sees the band road-tripping around desert landscapes. The track’s eponymous album will be released July 28.